ALBANY – It is with great sadness that we announce the peaceful passing of our beloved mother Elinor Austin Fox at age 83 on Sunday, July 4, 2010 after a prolonged battle with cancer. Elinor was born in Troy, NY to the late Edwin Austin and Ella Downs. She attended Vincentian Institute in Albany, and in September 1946 she married John B. Fox from Albany where her eight children were born and raised. 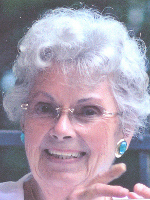 Throughout her life, she was a dedicated caregiver to her family including her mother. Through example, Elinor taught her children to be loving, responsible and hard-working. We will always cherish everything she taught us. She loved to play the piano and had a beautiful voice. Elinor also loved to exercise her mind every morning with the crossword puzzles, jumble and cryptoquip. Sundays were a special day when the Scrabble Challenge would begin after church with her loving family. On the quiet afternoons, she enjoyed painting and has a wonderful display of art throughout her home which is treasured by her family. In the late 1970’s, Elinor worked for the NYS Department of Lottery and Teacher’s Retirement. After retirement, Elinor and John spent several years in Deerfield Beach, Florida. After the passing of her husband, she returned to Albany to be closer to her children. She was the adored mother of Susan Miller (Stewart) of Las Vegas, Nevada; John A. Fox (Patricia) of Guilderland, NY; Paula Fox-Murphy of Troy, NY; Edwin Fox (Lora) of Latham, NY; Mary Ellen Macri (John) of Averill Park, NY; Paul E. Fox (Paula) of Loudonville, NY; Elinor McDermott (Tom) of East Greenbush, NY and Lisa Zarzycki of Rensselaer, NY. She is also survived by 8 grandchildren (Susan Sherr, Matthew Fraley, Tina Coughlin, Anthony Fox, Erin and Drew Fox and Michael and Joseph McDermott) and 4 great grandchildren. Her family would like to extend a special thank you to Albany Medical Center Hospital Pulmonary Department, most especially Dr. Thomas Smith and Marva George, who provided many years of outstanding care and compassion. For those who desire, memorial contributions can be made in memory of Elinor Fox to the Pulmonary Department at Albany Medical Center, c/o Albany Medical Center Foundation, P.O. Box 8928, Albany, NY 12208. Please come and celebrate Elinor’s life with us on Thursday, July 8, 2010, at Hans Funeral Home, 1088 Western Avenue, Albany, NY from 4:00 PM to 7:00 PM. A Mass of Christian Burial will be celebrated on Friday, July 9th at 9:30 a.m. in All Saints Catholic Church (the former St. Margaret Mary’s Church), Homestead St., Albany, NY (behind CVS). Relatives and friends are invited. To leave a message of condolence for the family or obtain directions to the funeral home, please visit www.HansFuneralHome.com . What a pretty lady….and John you look just like her. Having lost my Mom in May, I can say that it is so hard to say goodbye to her. I miss her terribly. Remember all the happy memories and surround yourself with your family and friends. My condolences to all of you. A mother’s love lives on in your hearts. I was saddened to learn of Elinor’s passing. We shared our Spiritual Journey through Tuesday morning Faith Sharing and First Friday Mass and lunch. Please accept my expression of sympathy and know you and Elinor will be remembered in my prayers. My thoughts and prayers to all my cousins! I loved your Mom! I can still hear her laughter and her stories. Sorry I can’t be there. You are in my thoughts and prayers at this difficult time! I didn’t know your mother, but she must have been wonderful; because you are one special lady and friend and the siblings I have met are all kind and fun loving! So sorry to hear about the loss of your mother. My thoughts are with you, Tom, Michael and Joseph. You have my deepest sympathy for the loss of your beloved mother, grandmother or great grandmother. Please take comfort in that she is now in a peaceful place where she is no longer suffering. We will be thinking of you at this time of sadness. I want to send my condolences to the family of Elinor Fox. I will greatly miss her and the conversations we had when she came to get her hair done. She was a friend and it was always a pleasure to see her. I am sorry I was not able to attend the wake. I will keep her in my thoughts and prayers. During the few short weeks that I knew Elinor I learned what a wonderful women she was, how much she loved her family, and how dedicated all of you were to her. As a family I hope that you will remember the happy memories you have shared together more frequently than you will remember her illness. I am glad that I had the opportunity to know her. My thoughts of sympathy are with you.